A comprehensive range of single chamber all stainless steel Vacuum Packing machines, designed to suit a variety of applications. Vacuum is a method of preserving raw, part cooked and cooked foods. The absence of oxygen resulting from the evacuation of air from the bag impairs the growth of bacteria. 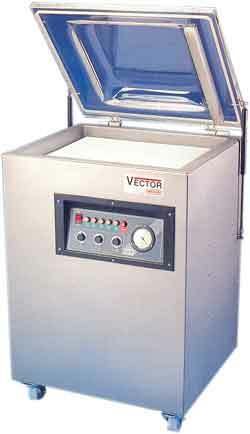 The Vector Vacuum Packers are designed to optimise this process by using Swiss maunufactured Busch pumps and incorporating design features which allow the machines to be used with total confidence. All machines, both bench and floor standing, incorporate hand operated controls with indicator lights to show the stage in the packing cycle. Options: Microprocessor control/soft air. Double seal. Cut off. Gas flushing.